I’ve had a post rattling around in my head for the past couple of weeks that I’ve wanted to write but haven’t been able to organize into something that is both coherent and cogent. The topic is something I have some pretty strong feelings about, which makes this even more frustrating for me. Here’s a hint: there’s more than one way to skin a cat in this weight loss adventure, and I disagree with the way so many folks seem to think is the only way to be successful at it. I’ll leave it at that, and perhaps tomorrow will be the day I get what’s been swirling around in my head together into something that makes sense. So in the meantime, I’ll leave you with my food for today. It was boring today, because I ate the same two things for three meals and the one snack I ate. I did get in 86 grams of protein today, 37 grams of carbs and 27 grams of fat, so I did pretty well on the day. I also downed just a cup shy of a gallon of fluid (water and unsweet tea) today, so my kidneys are happy campers. 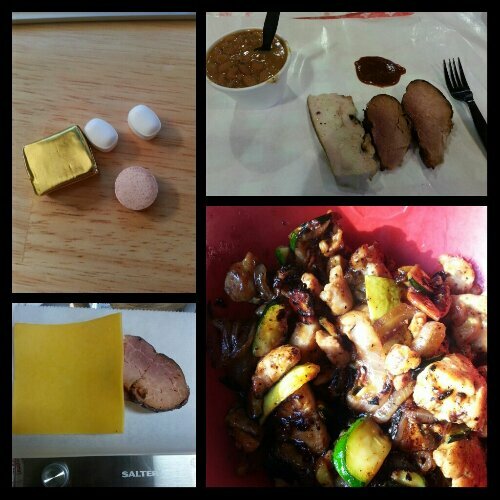 Today’s food choices, from upper right: leftover Rudy’s smoked ham and pinto beans; chicken, zucchini and onion stir fry bowl from Genghis Grill; Rudy’s smoked ham and a slice of cheddar cheese; multivitamin and calcium supplements x2, iron supplement. I go Monday morning for the 6-month blood draw my PCP is having me do. I’m a little anxious about what my bloodwork is going to show, but I won’t worry too much about it until Friday, when I get to see the results. Thursday, I see my surgeon for my 6-month followup, which I’m both anxious and excited about. I’m really hoping to be down exactly 100 pounds from the day of surgery by then, but with the havoc my hormones are currently wreaking on me, I’m not going to count on it. I just want to be able to stand on his scale and show him how well I’ve done since I last saw him. This entry was posted in daily bites, eating, la guerra, post-op, the sleeve, vsg, weight loss surgery, what's up doc? and tagged daily bites, eating, la guerra, post-op eating, post-op life, sleeve gastrectomy, VSG, vsg realness, what's up doc?, WLS. Bookmark the permalink. Looking forward to what you have to say. I’m intrigued, as I’ve got some strong opinions on some of the more popular ideas myself, can’t wait to see what you have to say. It’s coming…you won’t have to wait too much longer! You’re welcome. 🙂 I like to show people that post-op eating doesn’t have to be boring, and that we can eat “regular” food–you wouldn’t believe how often I get asked “Can you eat regular food?” WTF is “regular food?” What else would I eat?? ?